​This annual event is a wonderful coming together for so many former Air India employees of all ranks and station. They bring with them their own personal memories and experiences, and it is such a pleasure to interact with them. This year the Trustees invited me as a guest of honour, and the theme for my talk was A Tribute to J.R.D. Tata, The Magic of the Maharajah. I tried to highlight the wonderful creative work done under the stewardship of Mr. Tata, and the creative genius of persons like Kooka and Cowasjee. Much credit also goes to the talent at the Air-India design studio, and their agency, JWT (now HTA). In it’s early days, the airline had small budgets, and had to compete against aviations giants like PanAm, BOAC, KLM, Air France and Lufthansa. The approach they took was to stand out and be different in their advertising and communication which they built around the personality of the Maharajah. This was a highly successful strategy, and the airline found favour with Indian and foreign passengers, and became profitable and fast growing in no time. The Maharajah persona was a unique blend of charming, fun loving, chivalrous and sometimes mischievous. He had a special kind of charm and chutzpah, and often got away with a lot. I also spoke incidents when various persons in India abroad took offence moments when this got Mr. Tata in trouble. It is to his credit that he did not allow this to affect the creative freedom his team enjoyed. All these incidents were touched upon in a humorous manner, and the illustrations projected brought back nostalgic memories to the audience. I also exhibited 12 frames of Air-India artefacts related to the Maharajah theme, all dating back to the 1950s and 1960s. The exhibit was much appreciated by all who visited, and many suggested a permanent exhibit for the same. I displayed old airline posters, several sheets from the iconic 1964 calendar, decals, coasters, timetables, print advertisements, etc. Click the link here to see the entire exhibit. What I have in my collection is but a small fraction of the great work done by the airline. 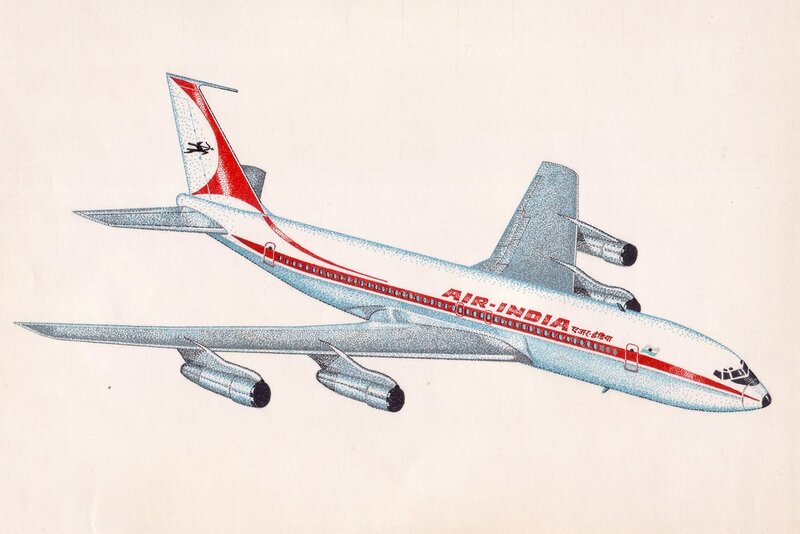 I can only hope that Air-India finds a way to preserve and display this proud legacy. This is a national treasure. Vivek Matthai and me at the event. 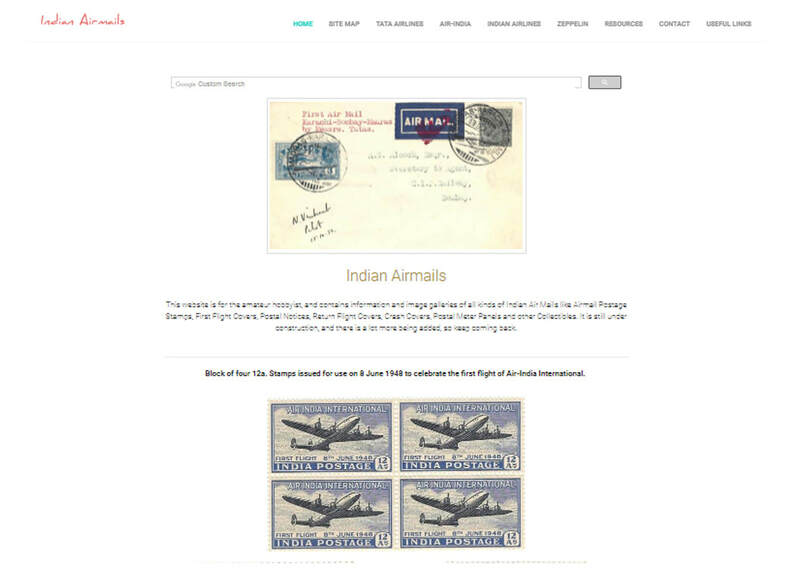 Just about two years after I set-up my website on Air-India Collectibles (www.airindiacollector.com), I have now launched my next website on Indian Airmails (www.indianairmails.com). This will allow me to post and share information on the subject, and images of airmail covers etc. I had started by posting a section on aerophilately on my previous web-site which I have now moved to the newer one. The two sites have been cross linked extensively so that some sections like the blog, resources page and useful links page are common. There is a more serious objective I had in mind as well. I have found very high quality documentation around Indian airmails related to the pre-World War II era (1911-1939). There are several sources for this and I have listed many of them on my resources page. During the World War II era (1939-1945), there is also a lot of information, but also glaring gaps exist. There is relatively less, and one may argue, a disappointing level of information in what is also a very interesting period of post-World War II airmails history. I would break this up into two parts, pre-nationalisation (1945-1953) and post-nationalisation (1953 onward). During the pre-nationalisation period there were as many as a dozen different airlines that carried airmails, and the routes, postmarks, rates and other details are not easily available in a single place. The post-1953 are again has been sadly neglected by postal history and airmail collectors. This website will over time attempt to fill this gap. One of the advantages of a website is that it allows you the freedom to keep adding (and correcting) information as you come across it. This is a feature I intend to exploit to the fullest measure. I have started by uploading information on the most fascinating Air-India, 8 June 1948 Bombay-London service, and also on the sister and predecessor airlines, Tata Sons (Aviation Division), Tata Airlines, Air India Ltd. I have also uploaded information on Indian Airlines which was formed after nationalisation in 1953. There is a section on Indian Zeppelin mails. This is not a widely collected field, but one that I personally enjoy tremendously. It includes mail flown on a Zeppelin or catapult mail service that has an Indian postage stamp, or is addressed to an Indian destination. I hope you will enjoy visiting the sites as much as I have enjoyed building them. I recently happened to acquire two very interesting hand painted covers, both from 1962, that commemorated the Air India First Flight from Sydney to Bombay on on 9 May 1962, and from Perth to Bombay on 3 October 1962. 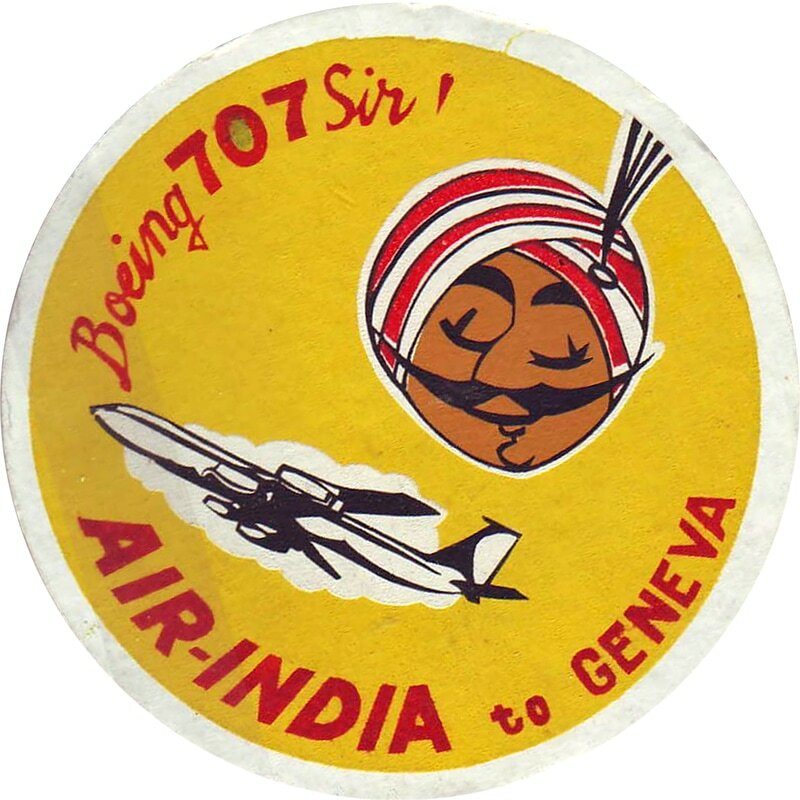 Until introduction of the Boeing 707 on the Sydney route in May 1962 the Sydney service was operated by Air-India using Lockheed Constellations and first started on 5 October 1956. 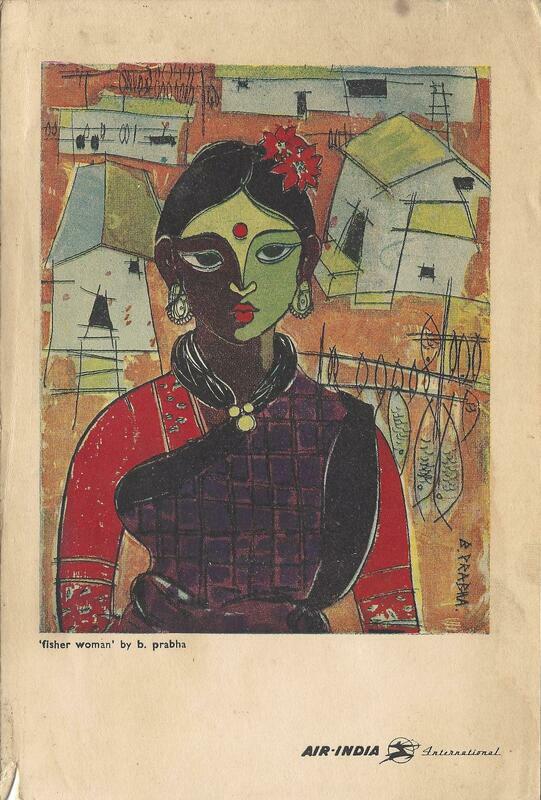 The Sydney cover has the hand painted Maharajah, and the violet oval Air-India first flight cachet. It is franked with an Australia 1'6 shilling postage stamp, and has a Sydney 9 May 62 postmark. Flight AI-407 departed Sydney on Wednesdays at 11.00 hrs and made it's way via Darwin (technical halt), Singapore, Bangkok and finally arrived at Bombay 23.40 hrs the same night, providing convenient connections for the onward Air-India flight to various European destinations, and on to London and New York. The aircraft here was the Nanga Parbat VT-DNZ. Darwin was abandoned as a technical halt upon introduction of Perth as a commercial halt on this service starting October 1962. AI-407 now departed from Sydney at 10.35 hrs every Wednesday, and flew via Perth, Singapore and Bangkok, arriving Bombay at 23.40 the same night, facilitating the same western connections as described above. This cover has similar 1'6 shilling franking, and is postmarked Perth 3 October 62, and has the violet oval Air-India First Flight cachet. The hand painted design here is a map of Australia and India depicting the Perth-Bombay connection. The artist has left out the intermediate stops in the drawing. Both covers are a treat, and I've never seen them before. Not sure how many of these were hand-painted, or who the artist was, but the artist's passion surely stands out. His initials R.W.B. are clearly visible in the bottom left corner. Delighted to add them to my collection. ​The First Flight from Karachi to Madras by Tata Sons Ltd., Aviation Department on 15 October 1932 was historic in many respects. In a sense it marked the birth of Indian Civil Aviation in the true sense. The schedule was arranged so that the mail arrived from Croydon on the incoming flight the previous evening at Karachi, and was picked up by the Tata service to depart early the next morning. After stops at Ahmedabad and Bombay, the flight halted overnight at Bellary, and continued the next morning on to Madras. J.R.D. Tata piloted the first flight from Karachi to Bombay, and Neville Vintcent onward to Madras. This event is also very special to Airmails collectors, and there are many beautiful and exciting items to be collected here. I had prepared a 5 frame exhibit which I displayed in Melbourne 2017 and you can see it by clicking the link here. This cover is perhaps unique, and I always use this expression with some amount of trepidation. It was handcrafted by Stephen Smith, and is a Type 1a and Type 2 combination cover. This is special for a variety of reasons; Handcrafted by Stephen H. Smith - only known example to me; Only example of mail from Britain to India using Tata souvenir covers; One of the very few examples of registered mail from Britain carried on this flight. This Registered Mail cover was postmarked Notting Hill, London on 5 October 1932 and arrived in Karachi on 14 October by IE 185, and then flown from Karachi, where the boxed First Flight cachet was applied, to Bombay reaching the same day, and then onward by surface to Calcutta, where it was delivered on 17 October. art collection in the early 1950s. A journey of a thousand miles begins with a single step. Thus started Air-India's art collection, now the nations greatest collection of art, artefacts and other historical objects outside a museum. 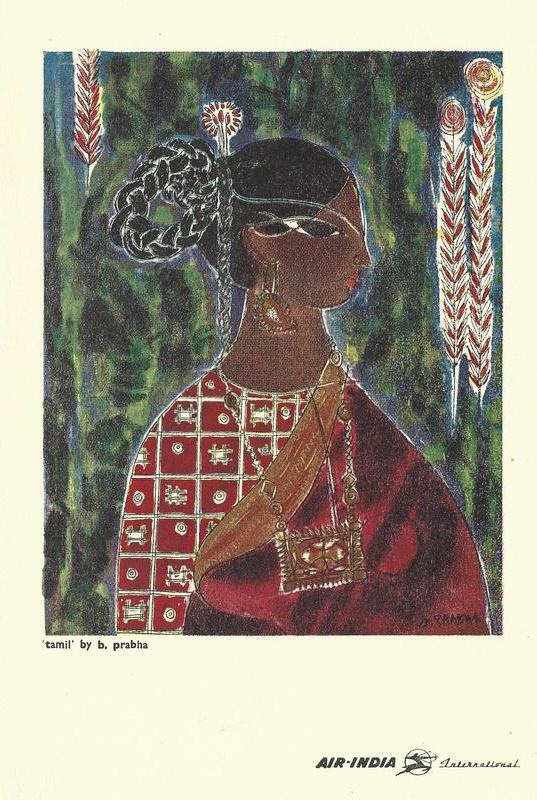 it was in the early 1950s that B. Prabha had come to Bombay having studied at the Nagur School of Art, and enrolled here at the Sir J. J School of Art. 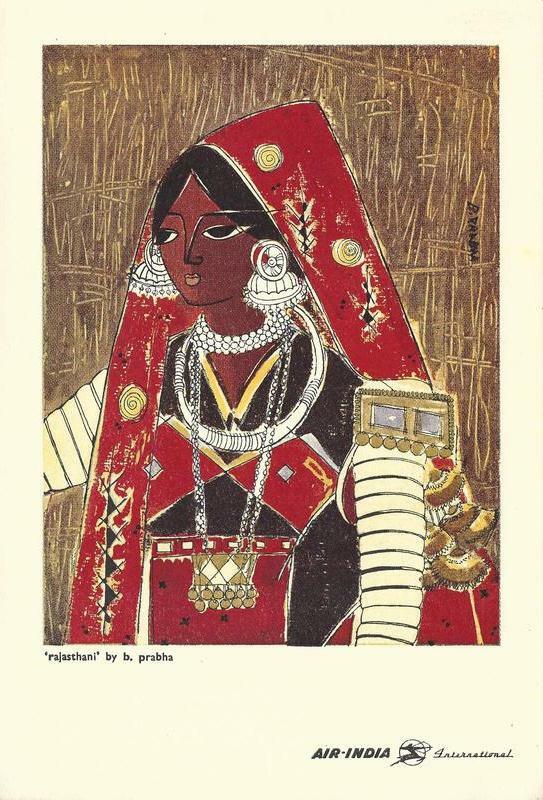 She had produced a series of 6-8 water colours, quite small in size, and themed on Indian Women. 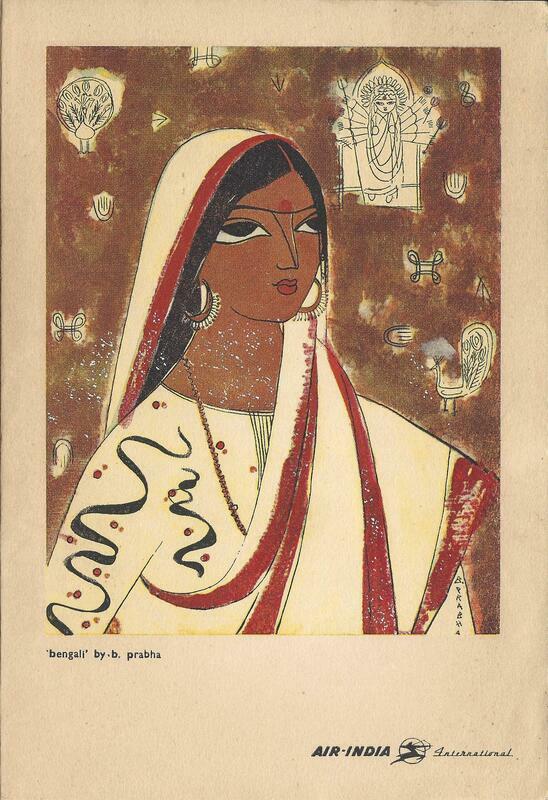 These were the first paintings purchased by Air-India and for a mere eighty-seven rupees and eight annas each. The paintings were used to adorn the covers of in-flight menu cards, and then displayed at the airlines London booking office. Even as recently as 1995, when the London office was refurbished, these paintings were carefully re-framed and prominently displayed there. Unusual baggage decal of the 1950s. I recently acquired a rather unusual baggage decal of the 1950s. This is by Air-India International with Paris as the destination. 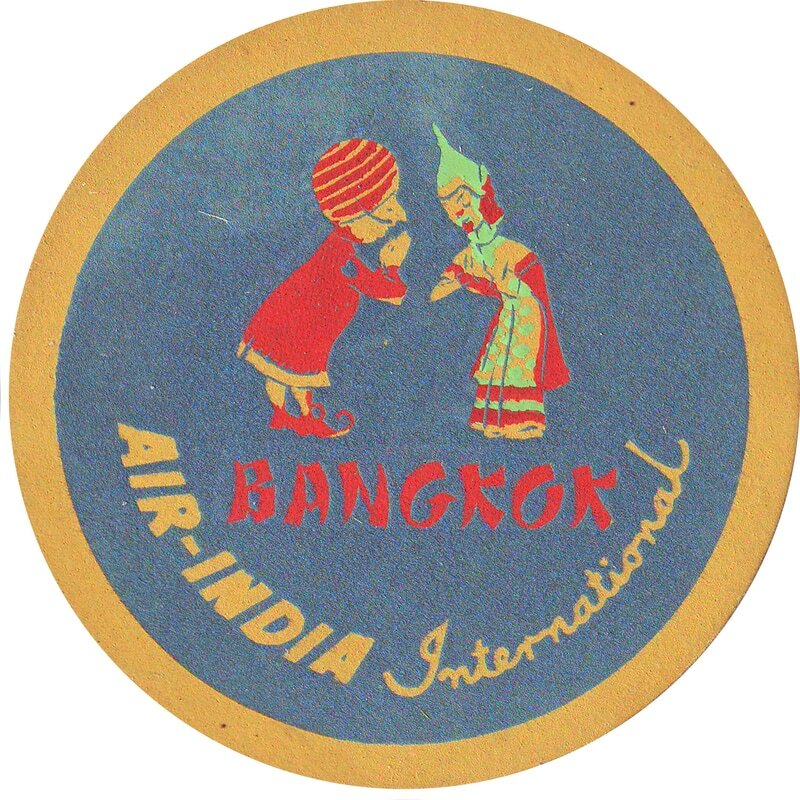 These pre-gummed decals were distributed by the airline to passengers to affix on their luggage and had the names of different destinations serviced by the airline along with a cartoon of the Maharajah greeting another person in the local style, and dressed in the traditional costume. The art for each of these was always cheerful and humorous, often a little cheeky. He was the Maharajah, and could get away with a lot. Here is a link to my website page with a comprehensive listing of all the decals in my collection. The 5 and 1/2 inch diameter decal I chanced upon recently was a new find, a design never seen by me before. Here we have a brightly dressed man, relpete with red scarf and green beret planting a kiss on the cheek of our rather coy Maharajah. I do admire the chutzpah, and the courage of his creators to publish a cartoon like this, and that to in the 1950s. With all the debate going around these days, one wonders whether our so called modern era has a thing or two to learn from the liberal '50s. of the Paris decal and coaster. In any case, the decal is hard to find, and perhaps had only a limited print run. 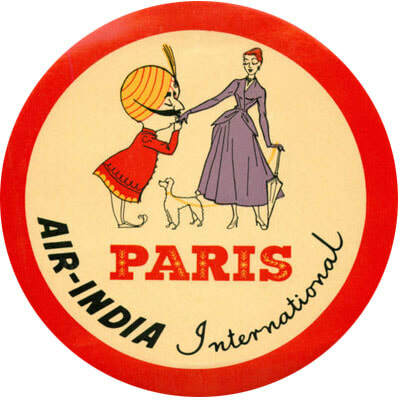 The more popular Paris decal has the Maharajah planting a rather gentlemanly kiss on the hand of a pretty Parisian maiden. This is the same design reproduced on the coaster, and was in use well into the 1960s. Enjoy both designs here, and draw your own conclusions. There are many coaster collectors world-wide. They tend to focus on specific themes. For instance, many of them collect coasters from pubs, bars and hotels, and yet others focus on brands of beer and ales. Among coaster collectors there is a smaller group that focuses on aviation themed coasters. Knut Wegers from Boenningstedt, Germany is one of the leading collectors of this type. Yes, he collects all kinds of aviation themed coasters made of all kind of material. 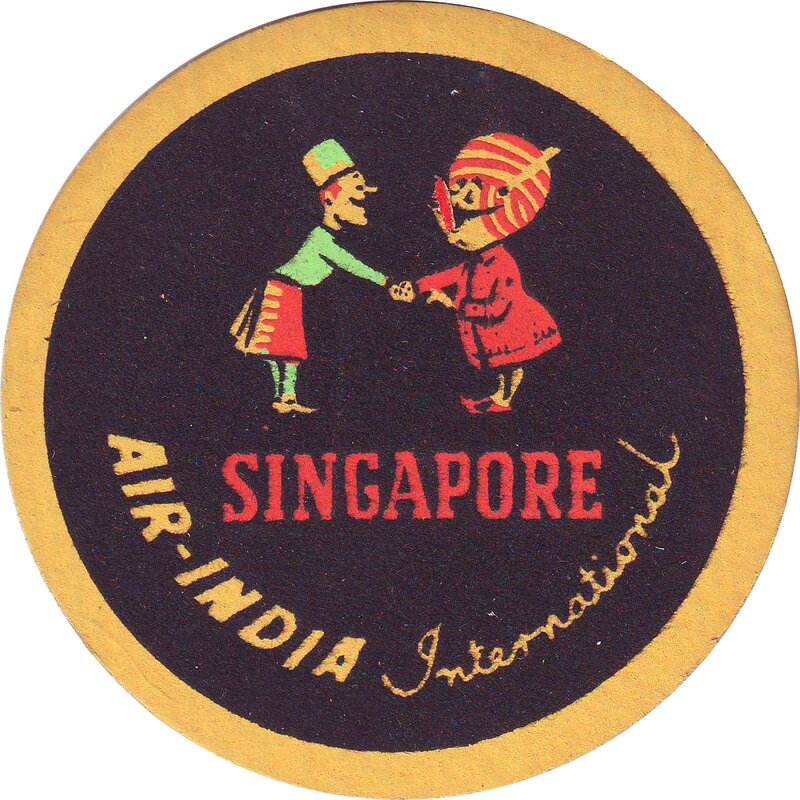 Knut chanced upon our web-site, and found the section on Air-India coasters which he says is very very informative and very interesting. His expanding collection now has around 4,500 different coasters from 530 different airlines. He is now an active 73 years of age, and has been collecting from the last 60 years, and he continues to work as a tax-consultant. 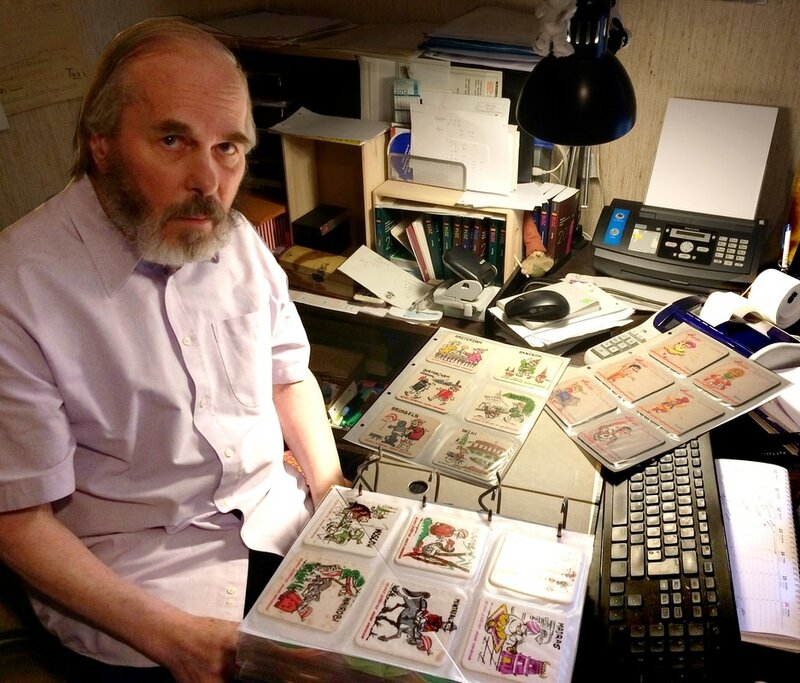 Knut has an extensive collection of Air-India coasters, and as an advanced collector, he collects both the twin sided, and single sided coasters as two different types. I asked him what he found most interesting about Air-India coasters, and this is what he had to say. “I like traveling and collecting and I was fascinated by the lot of different locations on the Air India coasters, but so far I did not manage to travel to all these locations only to all of the European ones, plus Beirut, Istanbul, New York, Toronto and Montreal”. 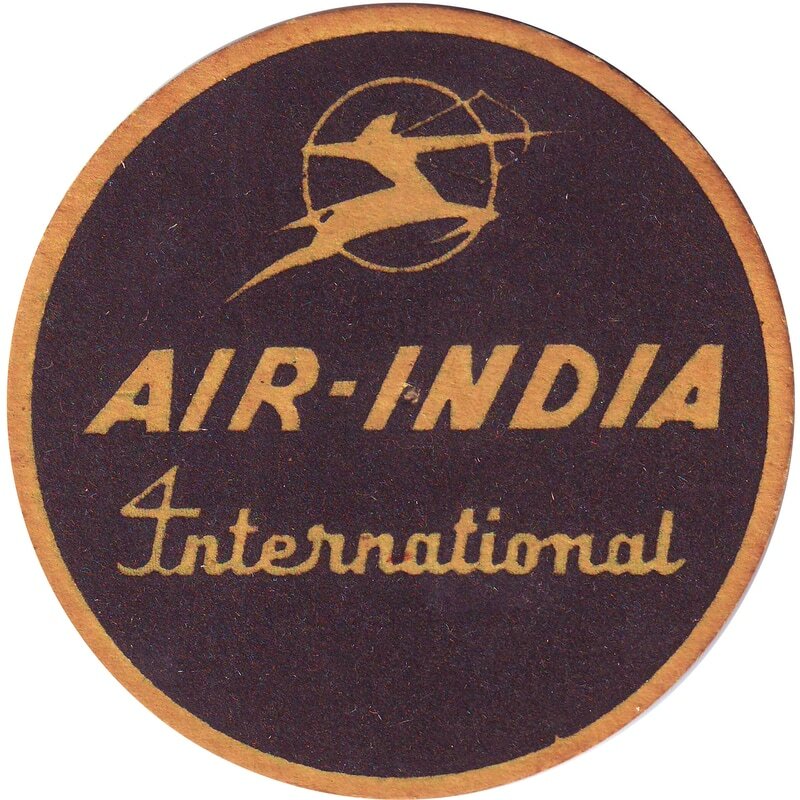 Among his collection are some rare old Air-India International coasters never seen by me before. They are made of a velvety type of material. He also has many flimsy material coasters, and has been kind enough to send me images. I plan to upload these images on the web-site shortly. So, here is wishing Knut all the best, and happy collecting. Here are some interesting coasters from Knut Wegers' collection. The first three from the left are quite old and rare. Ken has been collecting aviation memorabilia for over 30 years now, and has a vast collection of aviation memorabilia. He has also hosted a rich web-site (www.aerocollectors.com) with all kinds of Airline Advertising , Aviation illustrations, Aircraft profiles and Airline memorabilia. Among the Air India collection, I saw a large number of Maharajas of varying sizes, made of different materials. Also many rare baggage decals, beer coasters, time tables, maps, booklets, advertisements, menu cards etc. etc. ; truly a remarkable collection. Something really special were photographs going back to 1948, when the airline started. These are all ex-John Stroud, and exceedingly well preserved. Also a lovely collection of hand fans, matchboxes, and an acrylic Maharajah which is used as a promotional item on the travel agent counter. This one has hands that are riveted on the shoulder, so that the arms move freely. He is carrying a briefcase and is reminiscent of the 1956 (Frankfurt) Trade Show poster. Ken is also an artist, and his favourite subject is, yes, you guessed right, it is aircraft! He uses the stippling technique, where you paint by creating a decorative pattern making several small ink dots. 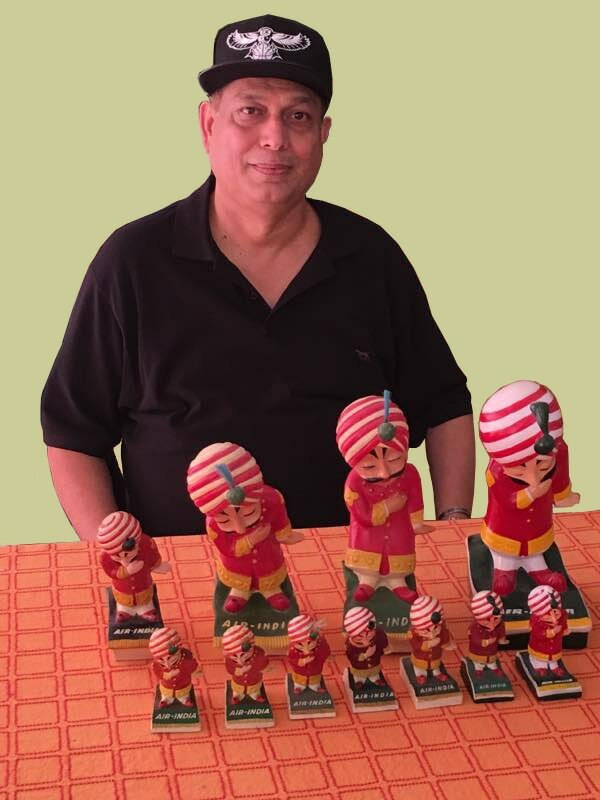 Using this technique he has created wonderful illustrations of Air India aircraft. Ken is also a gifted poet, and has published a book of airline verse, Voices from the Heart. So we had a great day trading stories about Air India, and here’s wishing Ken all the very best with his collecting. Here is the crystal Air India Maharajah made by Swarowski. A limited quantity was ordered for the Golden Jubilee of Air India in 1998, and I understand that only 50-100 pieces were ordered. Interestingly, the story goes that an even smaller number were delivered. I have written to Swarowski for more information, but no reply has come in from them so far. It appears that the order was processed by the Vienna office of Air India, and hence not much information is available in the airline as well. What I do know is that there was a grand celebration event held at the Taj Mahal Hotel in Mumbai, and Mr. J. R. D. Tata was invited as the chief guest. He spoke nostalgically about his years with the airline, and a Films Division documentary of the 1948 flight was also shown. The Swarowski Maharajah was also presented to Mr. Tata and other senior Air India officials. The one in my collection was graciously presented to me by a former Managing Director of the airline, and I am ever so grateful to him for his generosity. This is so rare that is all these years of collecting Air India memorabilia, I have never seen this on the market, in India or abroad. The Maharajah comes packed in molded foam, set inside a strong cylindrical box with a decorative motif and Air-India Centaur and Maharajah logos. How about an aircraft with no owner? Mysterious. Here is a picture of a DC-3 in Air-India International livery registered as VT-CGP. Just to spice things even more, here is one more photograph of the same aircraft below. 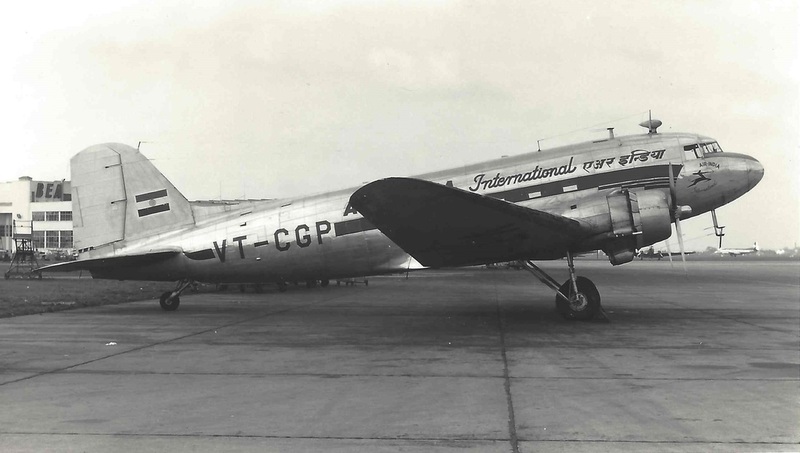 There is a note on the reverse of one of the photographs that records the plane as a Douglas DC-3 airplane VT-CGP, c/n 12928 (ex-42-108908) at London Airport in Air-India International livery, Silver, white, red, black. Picture taken on 24 March 1956. Now, I have checked the airlines web-site, lists maintained by Jeffrey Brown, airwhiners.net, and Warbirds of India, civilian registry, but could not come up with anything meaningful. The other question is, what was Air-india International doing with a DC-3 in London? Mysterious! would appreciate if someone would research this and enlighten us.